The phrase “punch back twice as hard” has been kicking around in politics for the last several years. While perhaps useful against an opponent’s political campaign, this advice is generally dead wrong when a corporation finds itself under attack by an activist group. Activists are striving not only for a contentious, public dispute that raises awareness of their issue and brand, but also to drag corporations away from their operational strengths and into a mud-slinging contest for which executives are unprepared. The Wall Street Journal reported this week that Canadian-based Resolute Forest Products has filed a lawsuit against Greenpeace for defamation, racketeering and conspiracy, claiming that Greenpeace photos and videos of forest damage were either staged or caused by fire or other natural causes. The lawsuit also challenges Greenpeace’s alleged targeting of Resolute customers. Activists excel at causing corporate pain with tactics that entangle a corporation’s retail consumers and business customers. Corporations must figure out how to respond to the wave of customer complaints (against the activist group’s harassment and the claims of negative corporate conduct), and the potentially significant loss of business. Resolute says that Greenpeace impersonated Resolute employees to gain access to proprietary customer information and to threaten Resolute customers. I think that Resolute highlights a fourth opportunity, however. Battling an activist group is typically dangerous because the corporation unwittingly fuels the activist group’s rise. A corporation’s social media channels, high traffic website, journalist outreach or public statements generate awareness for the activist group orders of magnitude greater than what the group could have accomplished alone. In this case, however, Greenpeace already possesses a global brand, and is itself a controversial entity. A lawsuit between a multibillion dollar company and Greenpeace is a battle between equals. While Resolute’s lawsuit is no doubt a drain on corporate resources, the public relations risk to the company is low. Corporations can lose to activist groups. The bad press is so overwhelming, the corporation’s stance is so embarrassing, and the internal friction is so severe that the company has no choice but to settle. The fight is over and there are no tactics that can reverse the damage. You give the activist group whatever they are asking for because there is nothing left to argue over and nothing gained from continuing on. We have seen SeaWorld reach this point, I think, with the Huffington Post publishing an article called, “The End of SeaWorld.” The author writes, accurately, that when it comes to SeaWorld, “The brand represents the torture of whales.” This is what the end of a successful activist campaign looks like – SeaWorld either reforms its business in a way that is blessed by the activists, or it gets stuck in the corporate death spiral of customers, investors and talented employees taking their resources elsewhere. A terrific scene in the movie Hoosiers takes place when one of Gene Hackman’s players fouls out of the game. Rather than replace the player with the team member being disciplined on the bench, Hackman tells the ref, “My team’s on the floor.” The camera cuts to a shot of Dennis Hopper in the stands, marveling at Hackman’s commitment to his principles. Activist groups are driven by their cause. While a corporate shakedown is often the ultimate objective, activists are true believers who will never be satisfied by half measures. Corporations must understand that you cannot appease activist groups with partial concessions or by agreeing to just some demands. These compromises only project weakness and telegraph to activist groups that victory is in sight. Yesterday marked a big win for activists, and even the very threat of activism. 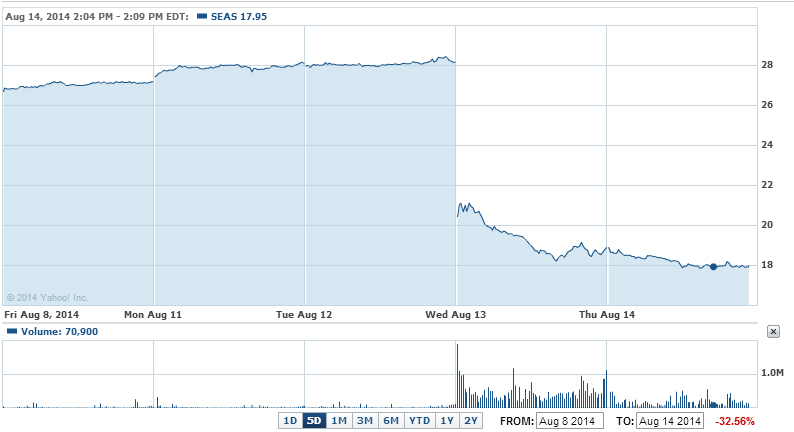 Shares of SeaWorld Entertainment fell 30 percent after the company reported disappointing results. SeaWorld gave a straightforward explanation for slumping park attendance: the controversy generated by the film Blackfish. As a public relations professional, I admire an activist campaign that can shave $750 million off a company’s market cap. But how much is SeaWorld to blame for its own predicament? Activists want you to engage them in a very contentious and public dispute. The publicity creates awareness for the activists’ cause, and a downward spiral of business distractions and diverted resources for the company. If your company’s business model is incompatible with an activist group’s demands – as in SeaWorld’s case – the only workable strategy is to de-escalate the conflict. Your message to every audience – press, public, customers – is that we care, we agree, and we are interested in working toward the best solution. If all parties appear to be working together, the agitation loses its purpose. One of the most important pages in my new book is the diagram of an activist group attack. The illustration identifies a corporation’s vulnerable areas, and the kinds of tactics activists use to stab at these weak spots. It’s already time for me to update my chart. One new frontier in activism is to literally bring the protests home. Google engineers, venture capitalists and local politicians have all been visited by groups of protesters, not at the office, but at their private residences. Then there’s the company’s financial position. This summer, a short trial was held for an environmental activist who temporarily crashed the stock price of an Australian mining company. He issued a fake but very realistic press release about a bank’s cancellation of a loan for an upcoming project. These tactics – both the threat and execution – are indeed a kind of extortion. Regardless, if a corporation decides to resist an activist group’s demands, the company’s executive leadership needs to understand the new rules of the game – except that it’s not a game anymore.